The new Southeast Asian tiger economy, Vietnam has shown a robust growth in the last years. With a large and dynamic population, the country has emerged to come at the forefront of international trade and become a very attractive target for international investments. Vietnam has only been open to business with the rest of the world for a couple decades, but its people cultural inclination for work and entrepreneurship have quickly revived its economy. Moving from a traditional and agricultural economy, the Vietnamese government has been slowly but steadily opening the economy to foreign investments and expatriate workers. An attractive tax system has also been implemented to help the growth of local businesses and ensure the attractiveness of the country to foreign investors. Heavily reliant upon agriculture, Vietnam has grown to become a leader in the production and export of several commodities, especially rice, coffee, rubber and sea products. The large population of Vietnam and important foreign investments have also made it an important production center for the textile industry, as well as for electronics. 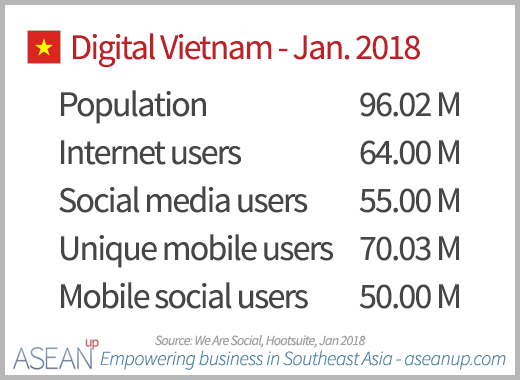 Its large population has made Vietnam one of the most active countries in the digital space. Pushed by the government which aims at developing new industries, the Vietnamese digital economy is also one of the active in Southeast Asia, with a developing startup landscape which is now also a hotbed for FinTech startups. With its growing economy, Vietnam is becoming every day more attractive for foreign business and employees. Even though salaries tend to be lower than in other countries of the region, certain dynamic industries, such as IT, provide great compensations to live in Vietnam. Having become a top exporters of several agricultural commodities, Vietnam is also a leader in export for the global textile industry and electronics. Experiencing a rapid growth in the tourism industry, Vietnam could become a regional leader in the coming years. Yet, Vietnam and its tourism businesses need to combat an important cultural setback if they want to reap the benefits of the country’s entrepreneurial spirit and grow tourism in quality as well as in quantity. Since its economic opening at the turn of the century, Vietnam has come a long way to become an emerging market with one of the fastest growth of the world. 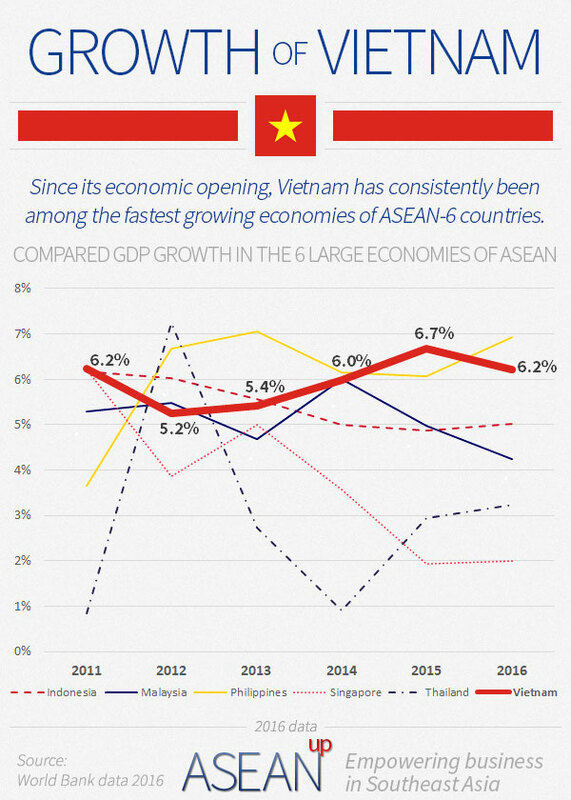 This series of infographics shows key demographic and economic data on Vietnam, as well as some perspectives with other ASEAN and world-leading countries. With rich historic sites and unique natural marvels, Vietnam is home to eight World Heritage Sites classified by the UNESCO. Remains of former capital cities, the entire ancient town of Hoi An, the world famous landscape of Ha Long Bay are a few jewel that attract an ever-growing number of tourists. The opening of the Vietnamese economy and society has a deep impact on its people’s uses and habits. In the entertainment industry, the diversification of movies on offer is changing tastes and interests. Here are some insights on cinema in Vietnam, from frequency to movie preferences and origins of movies. 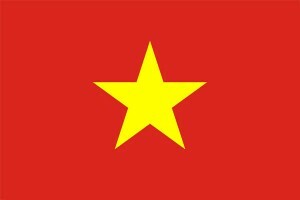 Vietnam has a dynamic startup environment with many entrepreneurs and companies engaged in the most promising sectors. And financial technologies – FinTech – have a lot promising applications in Vietnam as the country’s large population can profit from mobile technologies to access a growing number of innovative financial services. Taxes in Vietnam are rather on the low side globally: a low corporate income tax, a progressive income tax and a low VAT make the country generally interesting for business. Some other taxes, special rates and methods of calculations also need to be taken into account in order to properly assess fiscal expenses. For companies looking for staff or professionals planning their next career move, being well informed on the salaries compensating a particular skill set and experience is critical. 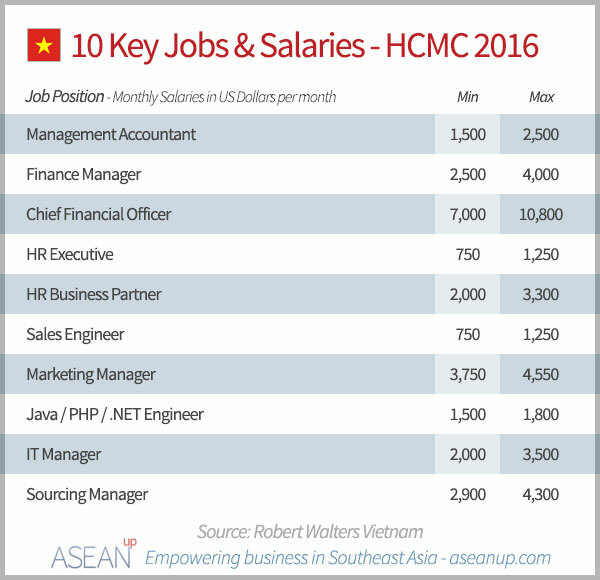 To this end, here are details on salaries rewarding several jobs positions in various sectors of the Vietnamese jobs market.